Baby scales are used in paediatrics for regular weight monitoring, especially in the case of general check-ups. In order to obtain the most reliable and comparable results, one should use calibrated baby scales. 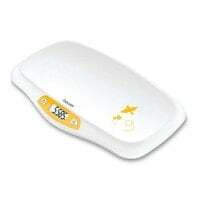 Here, you will find digital infant scales and toddler scales at affordable prices. 47,90 EUR* Not ready for shipping. Reserve today and we will ship as soon as possible. 50,31 EUR* Not ready for shipping. Reserve today and we will ship as soon as possible. 55,38 EUR* Not ready for shipping. Reserve today and we will ship as soon as possible. 24,95 EUR* Not ready for shipping. Reserve today and we will ship as soon as possible. 721,85 EUR* Not ready for shipping. Reserve today and we will ship as soon as possible. from 211,40 EUR* Not ready for shipping. Reserve today and we will ship as soon as possible. The weight plays a decisive roll during a baby examination and provides important information about the child's development. This is why the baby's body length and weight are checked during every early examination. In order to ensure that the measured values are comparable, one should use calibrated baby scales. A weight curve can be created for the baby and then compared with reference curves to provide an exact impression on the child's level of development. 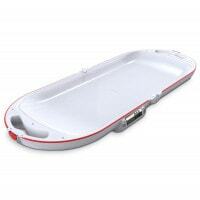 The baby scales is a special type of personal scales that is specifically designed for the requirements of paediatrics. The digital infant scales, as opposed to common scales, allow for weighing to be done in a lying position. For this purpose, baby scales are equipped with a so-called weighing dish, the shape of which allows the baby to lie safely within. The raised edges ensure that the baby cannot roll off of the weighing surface, even when it is restless and wiggling from side to side. The built-in display makes it easy to read the baby's weight while weighing. It is extremely difficult to determine consumption by babies who are being breastfed. This information is especially important for infants with slow development. Therefore, there are baby scales with a function that is often referred to as “Breast Milk Intake”. 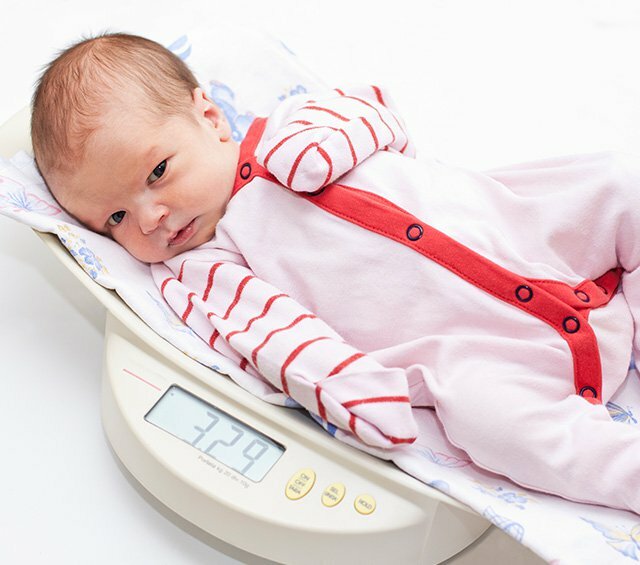 With these scales, the child is weighed prior to and after breastfeeding. 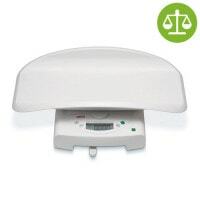 The electronic baby scales calculate the consumed breastmilk by comparing both weights. The paediatrician can use this information to decide how best to move forward regarding the baby's nutrition. To make the weighing process as pleasant as possible for the baby, many manufacturers use special materials for the weighing dish that are not only skin friendly, but also quickly take on the infant's body temperature to prevent it from cooling down. 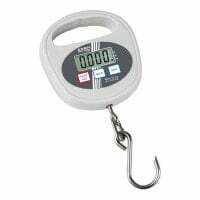 Furthermore, many digital baby scales are able to use a tare function to calculate the weight of an underlay or blanket out of the measurement so as not to falsify the actual results. As a rule, personal scales that are being used in medicine must be calibrated. 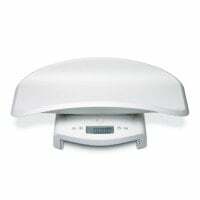 Naturally, this also applies for digital baby scales that are used in hospitals and general practices. Therefore, paediatricians and hospitals should look for a calibrated product when purchasing baby scales. The post-calibration of an infant scale, however, must be carried out when the scales are being used in a hospital. Outside of hospitals, in general practices for example, the initial calibration is valid forever and no post-calibration is necessary. 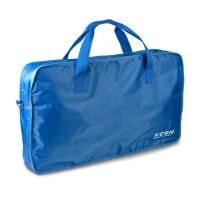 The infant scales used by midwives do not require calibration, as the profession is not considered medical by law. However, midwife associations still recommend the use of calibrated infant scales, as the baby weights can only be properly taken and compared with measurements from the paediatric office if the scales used are calibrated. All calibrated baby scales that you purchase from Praxisdienst already include the cost of the first calibration! There are no extra costs to you! Just look for this symbol! 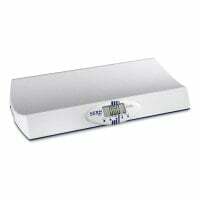 In order to ensure reliably measurement results from restless and wiggling babies, many electronic baby scales feature a hold function. This function ensures that the median weight is displayed to represent the baby's actual weight. Depending on the manufacturer, however, the hold function freezes the measurement results. Please inspect the function before and after purchasing so that you know exactly how it works. 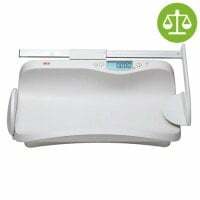 With many baby scales, you have the ability to transform the scale into a toddler scale within a few seconds be removing the weighing dish. This way, babies can be weighed in lying positions and toddlers can be weighed standing. 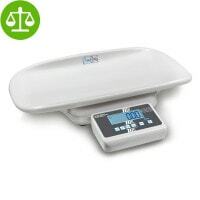 These scales have a larger weighing area than common infant scales to allow them to be used with children up to 3 years of age. In order to prevent infectious transmissions through baby scales, it is important to clean and disinfect it after every measurement. 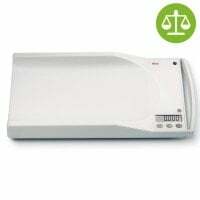 When purchasing a baby scale, you should also ensure that the lying surface can withstand disinfectants. Ideally, you should use a single-use underlay when weighing an infant. 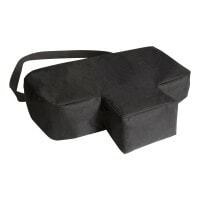 This not only makes the measurement particularly hygienic, but it is also more comfortable for the baby since the sensitive baby skin is not in direct contact with the cool material of the scales. 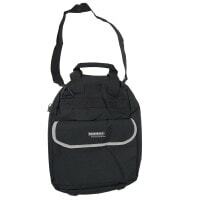 At Praxisdienst, you will find a large selection of Seca baby scales, Söhnle baby scales and infant scales from other manufacturers. Whether you need uncalibrated or calibrated baby scales or those with a built-in or removable weighing surface, you are guaranteed to find the proper baby scales here. 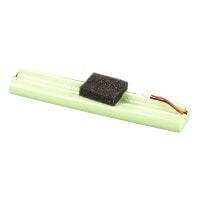 In our online shop, you can also buy the compatible batteries for your scales at affordable prices. Do you have questions about our baby scales or need advice? 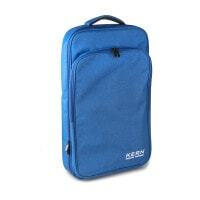 You can reach our customer service by live chat, email or telephone.